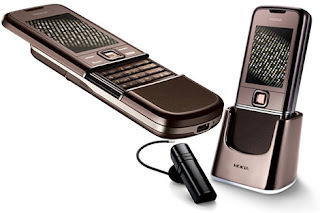 Nokia has rolled out their new 8800s. They are the Nokia 8800 Arte and Nokia 8800 Sapphire Arte, featuring an elegant and sophisticated design theme that takes inspiration from nature and sets it apart from the crowd. By tapping the steel surface below the display, you will get an analogue clock appears. They have the 'turn-to-mute' feature which allows user to quiet their phone by simply turning the over the phone, the screen-side down. 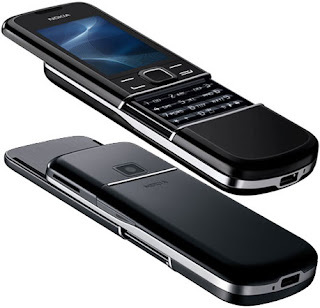 Nokia Nokia 8800 Arte and Nokia 8800 Sapphire Arte come with a 2.0-inch QVGA 240×320 pixels, OLED display with up to 16 million colors, 3.2-megapixel camera with 8x digital zoom, 3G capabilities, 1GB built-in memory storage, microUSB all-in-one connector and an anti-fingerprint coating on its glass and metal. The Nokia Nokia 8800 Arte will be available in the fourth quarter of 2007 with an estimated retail price of 1000 EURO while the Nokia 8800 Sapphire Arte will follow in the first quarter of 2008 and retail for approximately 1150 EURO, both prices are excluding taxes and subsidies.